What makes the British Federation such a special and unique Masonic Order? As a recently affiliated member perhaps I can humbly offer an answer to this question being as I am new to the order and, in theory, totally unbiased. Maybe not totally unbiased since I do have a point of reference to which I can compare Le Droit Humain: my previous Masonic reincarnation. I think that disagreement with the 1717 Anderson constitution landmarks is an obvious place to start for a member of Le Droit Humain and I also think that this is a subject that is so clear to us who disagree with these landmarks (or some of them, in particular with the prohibition to accept women) that there is no need to further discuss it. Suffice it to say that to exclude more than fifty per cent of the human population is in itself a disregard for the Democratic essence of Freemasonry. It reminds me of how Aristoteles talks about the freedom and democratic values of Greek citizens in his “Politics” without sparing one thought for those who didn’t have the rank of citizen, i.e. the slave population. A very odd notion of democracy indeed. It is also important to note that there isn’t “one Freemasonry” but several Masonic orders or models of Freemasonry roughly split between Regular or Dogmatic orders (depending on the point of view of the speaker, pretty much like the difference between the use of the terms terrorist and freedom fighter) and Irregular or Liberal orders (ditto). Some Masonic orders focus on the social and fraternal aspects of the Craft and don’t get too involved with the symbolic and esoteric side of Freemasonry. Other Masonic orders are really involved in social and political affairs and yet other orders see Freemasonry as the heir of the Enlightenment and approach the Craft from a philosophical standpoint. Remarkably or paradoxically I might say, for some Masonic orders Freemasonry isn’t a spiritual pursuit. This is exactly the same conclusion I had reached on my own during my ten years in Freemasonry- although I appeared to be the only one reaching this conclusion in my old Order. It would be fanciful to pretend that what we do today in a Masonic meeting is what the High Priests from Eleusis did in their Mysteries or that the first Freemason was an Egyptian Pharaoh or a Gnostic leader from the I Century or even an alchemist from the middle ages but it is clear that there is such an undercurrent in the history of Western culture, a golden thread, and that Freemasonry is an expression of that undercurrent today. 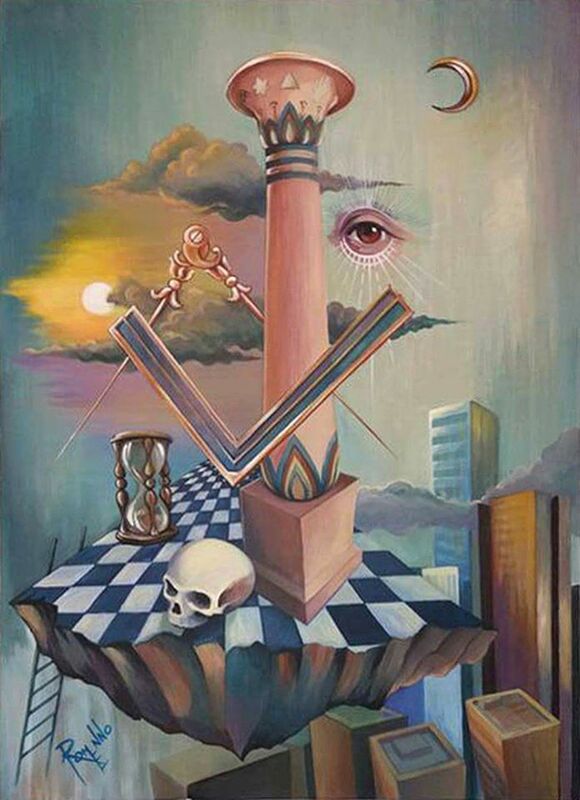 Freemasonry is at the end of a long line- that golden thread- that started with the Ancient Mysteries and continued with the Gnostics, the Neo- Platonists, the Alchemists, Renaissance Magic and Kabbalism, the Rosicrucians etc. The Eleusinian mysteries were open to everyone: men, women and slaves. There were processions and initiation ceremonies. The mysteries tried to repair or heal the loss described in the myth of Persephone and Demeter in order to achieve a kind of magical summoning of agricultural fertility. The intention was not unlike the one that the people who lived in the Neolithic period had when they painted enormous, disproportionate Mammoths in their caves with the hope of hunting down the largest possible pray available: an act of sympathetic magic, of transferring the ideal into the real in order to obtain tangible results. I personally believe that what we do in Freemasonry, among other things, is to unite that which has been dispersed. Masonic ritual demands that we acquire self knowledge and perhaps knowledge of the Divine or the Transcendent. And the British Federation is entirely focused on this notion as far as I can see. This may be partly due to the Theosophical background of the founder but can also be seen in the names of the lodges: Light of Amen Ra, Maa Kheru, Golden Rule, Hermes, St Germain...and also in the particular mottos of these lodges: “The light is within you, let the light shine” “From the Unreal lead us to the Real, from Darkness to Light, from Death to Immortality” etc. I have been privileged to witness this spiritual and intellectual pursuit first hand in a number of degree ceremonies. But I have also been very privileged to see the fraternal side of the British Federation in action when the new R.W.M was installed in the Chair of King Solomon recently at a lodge meeting. The warmth, the fraternalism and dare I say it the love shown to both the Master Elect and the Installing Master was touching. In fact it was something tangible that permeated the whole ceremony. This is an order in which one can always be an absolute beginner, a permanent entered apprentice regardless of his or her Masonic rank- chatting in the library with a long serving R.W.M and a MM I was made aware of some analogies between the mudras from Yoga and the signs and grips used in Freemasonry, both miles away culturally but human expressions, perhaps, of the desire to unite Mind, Body and Soul. There is never a dull conversation in Hexagon House. Not one mention of golf or of Masonic rank in fact. Rank is about service in the British Federation: As Georges Martin said somewhere the difference between a MM and a 33 degree in Le Droit Humain is that both have the same rights but the 33 degree brother (sister) has more responsibilities. I noticed this from the first day. For the members of Le Droit Humain rank equals service to others. The beautiful ideal of the Philosopher King springs to mind. Shame we don’t see this in the profane world. Regardless of their rank, the members are constantly learning. When we stop learning we die. So here is a Masonic order, Le Droit Humain, British Federation, that has managed to combine the fraternal aspects of freemasonry with a stimulating and challenging pursuit of Truth, Self knowledge and spirituality. This has to be the reason why our ritual is filled with Gnostic and neo-platonic references after all. So to employ a rather crude expression, this model of Freemasonry “ticks all the boxes”. I would like to be able to balance this article by saying something negative. I can’t. The members, my lodge brothers and sisters have been nothing but welcoming, accommodating and supportive. The question wasn’t should I join but rather how could I not join. I have much to learn and maybe because of this I feel alive again. May God preserve the Craft.